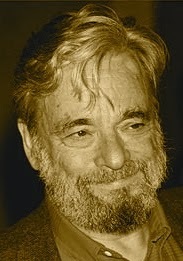 A Year of Being Here: Stephen Sondheim: "Children Will Listen"
Nothing's all black, but then nothing's all white? Careful before you say "Listen to me"
"Don't slip away and I won't hold so tight?" What do you leave to your child when you're dead? "Children Will Listen" by Stephen Sondheim, from Into the Woods, a musical with music and lyrics by Stephen Sondheim. Debuted in 1986. Performance here by Maria Friedman and the BBC Concert Orchestra during "Sondheim at 80" at the Royal Albert Hall, London, England, August, 2010.